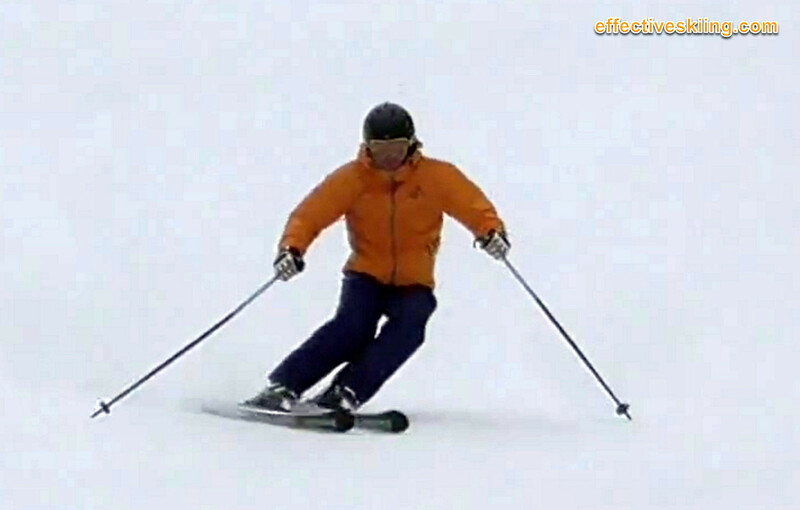 The separation of the upper and lower body is one of the most important skills of any great skier... but where exactly is it most effective to separate the two? The hip? The pelvis? The core? But... do the shoulders move together with the arms? Do the hips stay with the boots? When beginners start to separate, they tend to separate around the core, as they put the focus on the shoulders and maybe the arms. Typical instruction like Keep the shoulders (or body) facing down the slope or the Picture frame or skiing with the poles in front drills tend to create this artificial separation in the core area. One issue with that is that the spine is stressed, as the separation in this case involves twisting and bending of the spine - so any additional stress (from absorbing a bump or a compensating for a skid etc) will go straight back into the spine. 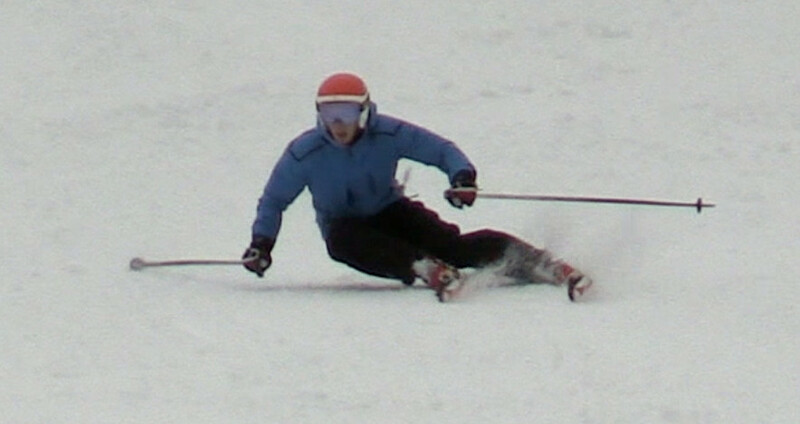 Also, the range of motion is severely reduced if the skier relies on bending and twisting of the spine to create separation. Learning new skills, like maintaining a narrow stance, also impacts separation, as visible in the photo above. So, the most effective separation will occur at the hip joints. Some like to think of it as the femurs turning in all directions in the hips sockets (turning the lower body1) while some prefer to let the skis do the turning and focus on how the upper body should compensate2. When skiers separate effectively, the hips and shoulders tend to move as a unit either laterally or rotationally and so do the arms. 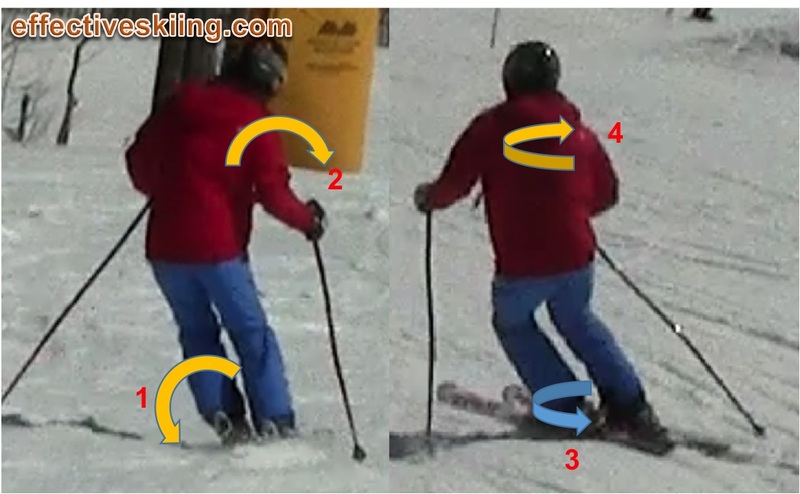 The result of effective separation in all planes is that the upper body has the appearance of remaining still, while the legs and feet tip and turn underneath, more so in Slalom and less so at speed - where the larger forces require more stacking of the body. Much better cues to encourage effective separation are Lifting the inside hip and Strong inside half. The available range of motion of certain joints can be an issue for some - this can be addressed to some extent via dryland training. Viewed 2373 times ( | Print ) this page.